More than two-thirds of us will lose a tooth by age 45 due to gum disease or decay. There are, fortunately, several methods used to fix adult teeth, including partial dentures, dental bridges, dentures, and dental implants. When at all possible, dental implants are recommended by our expert periodontists to fix adult teeth as they have many advantages over some conventional treatments. Dental implants are a permanent solution to fix adult teeth. Each dental implant consists of a post, abutment, and dental crown. The titanium posts are implanted into the jaw bone, integrating with the bone over a period of four to six months. This osseointegration process creates a strong foundation similar to that of your natural tooth root. These dental implant “posts” are then fitted with abutments, which serve as a connector between the post and the crown, or a crown is directly screwed into the post itself. 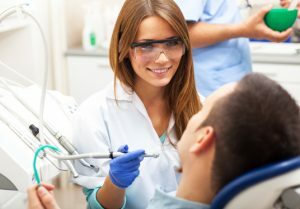 The periodontists at Lightfoot Center for Laser Periodontics work with your restorative dentist to create the healthiest and most cosmetic way to secure your crowns, which appear to rise up from the gum line and are designed to match your surrounding teeth. Conventional crowns and bridges are generally expected to last 5-20 years. Dental implants, if maintained well by the patient at home and by having regular dental professional care, can last 20 years to a lifetime! Dental implants not only fix adult teeth, they also preserve bone. When a tooth is lost, a process of bone deterioration begins at the site of the missing tooth. This bone loss affects the jaw bone and consequently, your facial structure. When implants are placed, the titanium post stimulates the jaw bone, just as your natural tooth root would, stopping the deterioration process. This is why many patients who opt for dental implants after wearing dentures for many years may require bone grafting procedures to ensure that they have sufficient bone for successful implant placement and integration.